So, I got this tattoo. And everyone who sees it asks, "What does Collective Addiction mean?" Why would I choose to have that writen on my arm, for the rest of my life? I'm sure that is what my mom was wondering, as she screamed at me the first time she saw it. 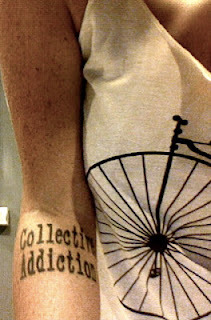 I chose to have "Collective Addiction" needled into my arm for the rest of my life for a variety of reasons. The first, and most important reason, is my brother. My little brother is my favorite person in this world. He is kind, he is caring, he is funny, he is intelligent, he is creative and most importantly, his mind is always open. He is my best friend. There is no one in my life quite like him. We have both always experimented with substances, and while I had my radical highs and extreme lows over the years, he remained pretty constant and stable with anything he chose to try. I was never worried about my brother or concerned about the things he did. My brother is much more logical than I am, and far far less impulsive. I figured anything he tried was in good fun. His second year into university he began what would be a downward spiral into heroine use. It didn't happen over night, or over the span of a week, a month, or even two months. But the hard fact to face, was that it happened over a long period of time, and many people who loved him sat by and watched, and when he had finally reached his lowest point, suddenly it seemed as if it happened in the blink of an eye. Collective Addiction is about my brother's experience as an addict, in regard to my relationship with him, as well as the relationship to my family. Collectively, my parents and I are all experiencing what my brother went through. What he is still going through. To love someone is to live with their addiction, to make it yours. I am not suggesting that it means you use with them, but rather you put yourself in their shoes. You learn to live with the mindset of an addict, in order to relate to the issues and needs that they are. When he is low, so am I. When he feels sick, depressed, tired or frustrated, so do I. It is a collective addiction because loving someone with all of your heart means that when their heart hurts, so will yours. To appropriate my brother's addiction and make it a collective experience is to suggest that we all experience the highs and lows together. It is a journey that my family is tied together in, and throughout it we will experience a range of emotions at different times. The highs I get from spending a day with him now that he is clean, are different than the highs my parents get through their relationships with him. We all hit our low points at different times, and because it is a collective experience, I realized that one of the most important things was recognizing when one of your family members is having a low, and being there for them, just as much as you are for the addict. There were days that my father sat across from me at our kitchen table, and the words he used to describe how he felt were those that will never leave my head. There were the countless occasions when my mom confided in me how scared she was. All the times she asked me if I knew what to do. What the best options would be to help him. I never in a million years thought as the child my parents would be asking for help from the person they were raising. My parents had their days, where, like my brother, they didn't want to leave bed. They didn't want to deal with the world that day. To have "Collective Addiction" on my arm is a reminder that no one ever goes through anything alone. There is a fine line between sobriety an addiction, and many times it is possible to have a foot planted on both sides. To step back and forth between them, and know what it is to be hurting yourself, as well as to be sober and see someone you love drowning in addiction. It's been over five years since I've had to face addiction issues, but I will never forget that for the other half of this past decade, I dragged my body through every imaginable damaging substance I could get my hands on. There was a disregard for my mind and for my body, and there are nights I should not have lived through, mornings that were not meant to be mine. I look back at pictures of who I was over the years and read past writing, and I can not believe how far I have come as I sit here and write this. By no means do I think I am a fully developed mature person, but I can say with certainty that any of my close friends that knew me back then, will remember what a roller coaster of abuse and impulsiveness I was, and how now I have found a source of gravity in my life to build from. Addiction happens at different parts in peoples' lives, at varying stages and levels, and while I have surpassed any addictions from years ago, I still stood on the same side as my brother, and that's not something to put away in the past and forget. The other reason I got the tattoo was because addiction does not have to be a negative thing. For me, addiction is the purest form of passion. It is passion without dilution. It is the absolute love you have for something in this world. Addiction is the strongest term to describe something, someone or somewhere you can not live without. My lifelong addiction has been, and always will be, writing. I have a stack of notebooks filled with years and years of personal history, that towers over two feet high when stacked on top of one another. If I removed writing from my life, there would be an empty void that nothing else could fill. Nothing satisfies the same needs in my life as the written word. A finished piece of writing that I am proud of gives my mind its high. And then there is the constant addiction to edit. To rewrite. To change the order of the symbols that comprise words that when put in certain patterns, make sentences. Without writing my mind becomes hectic, chaotic, cluttered and I have no way to release myself from my own thoughts. So while not everyone shares the same addiction as I do, we all have that something. We are all collectively experiencing passion, and if you are not, I feel sorry for you. Passion is what drives this world. Passion is what we live for. What brings enjoyment into our days. Collective Addiction. Do not forget what it is you love. Who it is you love. I absolutely love this. I too am a writing addict and I find that the times when I am in the throes of withdrawals are when I turn to other, more harmful addictions. Thank you for sharing your lifeblood in these words. I appreciate every one.